Joanne Choi has a blog called Week of Menus that I really like. I’ve written about it before. Her tagline – “Good cooking for moms with too much on their plate” sums up her approach. Food is healthy, tasty, and easy to prepare. About two weeks ago I made a meal that was composed of four of her recipes. Two salads provides lots of fresh veggies. 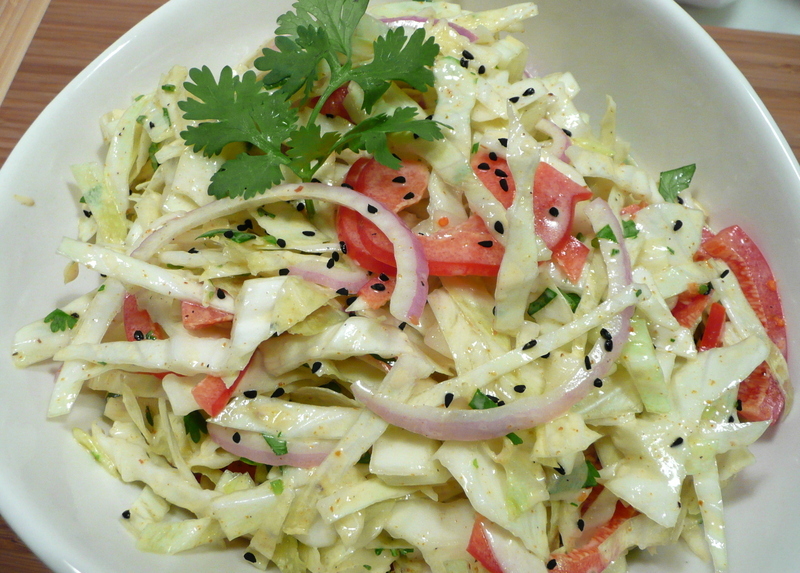 The first was a Curried Slaw made with green cabbage, red onions and carrots. I forgot to buy a carrot so my version was missing that extra dimension. Still, very taste as lots of curry powder gives it an exciting warmth while not being spicy. 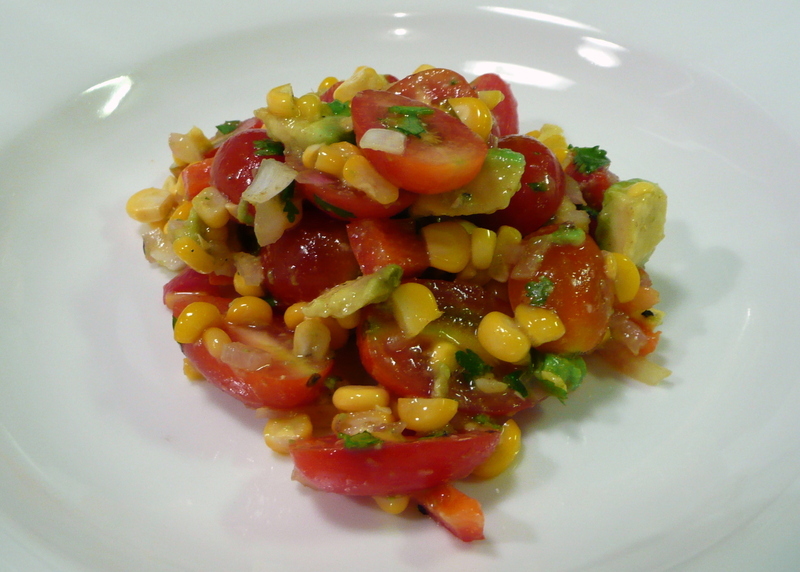 The second salad was a Corn Salad with Tomatoes, Avocado and Cilantro. What a yummy way to use up fresh corn and cherry tomatoes. We’re fortunate to get corn year-round and while our varieties of larger tomatoes are pale and disappointing, our locally grown cherry tomatoes are also year-round winners. I didn’t measure my proportions very well and could have used a bit more avocado. 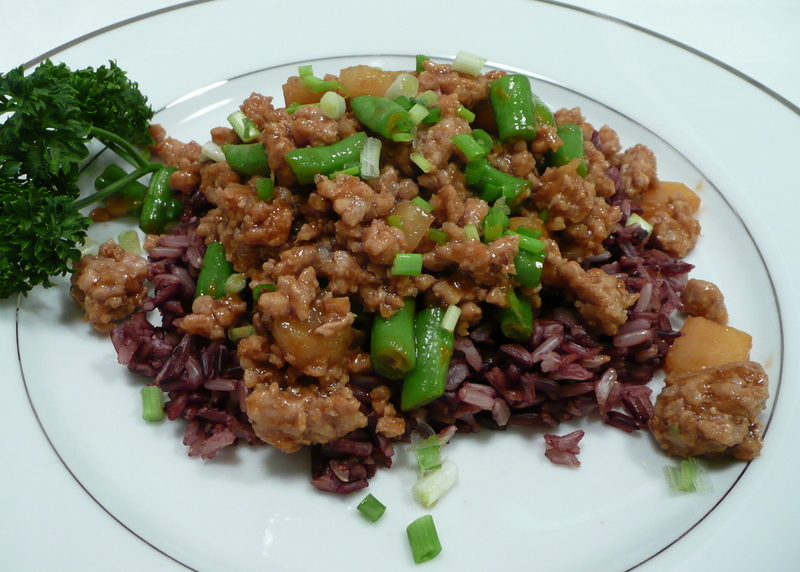 The main dish, one I’ve tried before, is Ground Pork and Green Beans over Rice. This can also be done as a lettuce wrap, which is how I did it last time. Joanne’s original recipe calls for ground turkey, but that’s not readily available here in Thailand. Made with hoisin sauce (and I added some water chestnuts), this dish has plenty of umami. 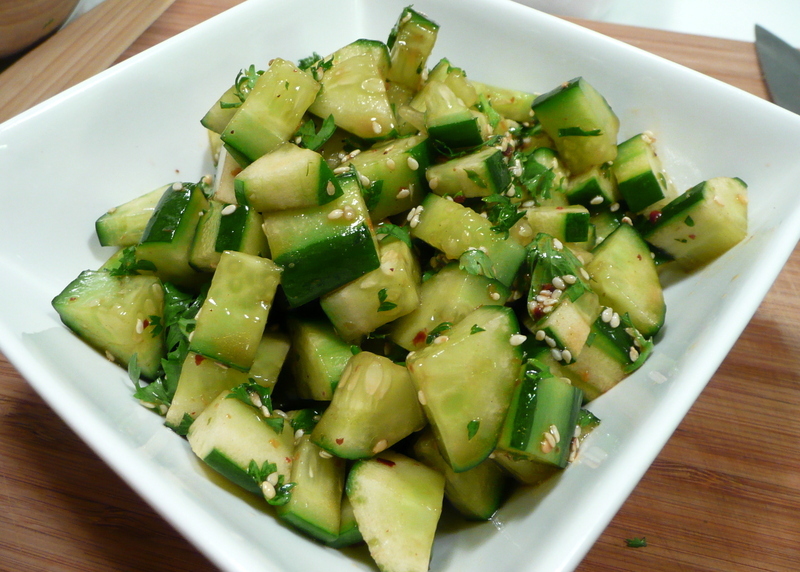 To complement the rich taste of the main course, I made the Cucumber Cilantro Salad, a pickle-like dish that was mildly spicy and a nice accompaniment. The dressing is made of soy sauce, red wine vinegar and sesame oil. A liberal sprinkling of sesame seeds and dried chili flakes added texture and flavor excitement. Something I really like about our eating habits is that when I head to the checkout counter at the grocery store, nearly everything is a fresh vegetable, fruit or herb. There is some meat, dairy product and whole grains, but few prepared foods. I don’t say this to boast; I say this to make the point that it is possible to create really tasty, really healthy food even while living a busy life. If you would like some ideas to spark your creativity, check out Joanne’s website. This entry was posted in Uncategorized and tagged cooking, food, week of menus by christao408. Bookmark the permalink. That looks delicious! How often do you go shopping for groceries might I ask? I used to go to the market everyday when I lived in Asia due to the lack of refrigerators in the households. I love that we don’t eat a lot of prepared foods either. Cooking is relaxing to both Phil and I and we’d rather cook than anything else. It’s amazing how quickly you can cook really yummy things and they always taste better than the prepared food anyhow. The corn salad looks amazing! @TheCheshireGrins – It sounds like we’re completely on the same page. Why don’t you come over to Bangkok and we’ll have a dinner party? @Rm2046 – We have a number of nearby supermarkets along with a true local fresh market within walking distance. I usually go to the market every second or third day. Since I hate to buy food and have it go to waste, I’ll just pick ingredients up as I have specific dishes in mind. There are always some staples on hand, though, so I can through something together in a pinch. @zozoyork – @yang1815 – Very tasty indeed! @chow@ireallylikefood – Judging from your site, you might find her recipes to be a bit too basic. But I shouldn’t draw any conclusions without knowing you better, should I? Hope you find it interesting. @YNOTswim – Yes, the pickle-making technique. I’ve been thinking about getting one of those little Japanese pickle machines that add the pressure to help extract the juices. Just what I need – one more gadget! The dishes all looked very good, especially the cucmber salad. I’ll definitely bookmark that website! @chow@ireallylikefood – Very good. Glad to hear you’re a keep it simple cook. It is easy to get drawn to distraction in the kitchen. I’ll have to spend more time over on IReallyLikeFood – other than a few visits, I haven’t followed those blogs very much. The Ingredient of the Week feature sounds interesting. @CurryPuffy – Hope you enjoy it. My entry about the trial of W’s biscuit recipe is about to go live. @christao408 – Live! Will be on the look out! @joburgboy – Okay, so that means my clever plan is working. Food posts coordinated with meal times across the globes. @christao408 – hee hee…. I’m finally catching up to all the posts… it’s taken awhile. I like these simple but nutritious foods that you can cook quickly. The pork dish looks very tempting and I’m sure the water chestnuts give it a very nice complimentary crunchiness. @ElusiveWords – Didn’t realize you were behind. Yes, it is a tasty and really simple dish to make.